By default, Software Update runs automatically on a weekly basis. 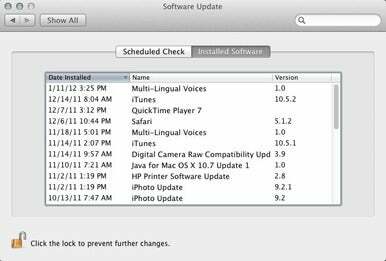 You can change the frequency, or even turn it off—the settings for Software Update (for both Lion and Snow Leopard) are found in System Preferences; the Software Update icon can be found in the System section. Here’s how to customize Software Update to your liking. When you open the Software Update system preference, it opens to the Scheduled Check portion of the settings. Here, you can manually perform a check for updates by clicking on the Check Now button. Below that is where you can set the automatic frequency for Software Update. In Lion, if the settings are dimmed, you must click on the padlock in the lower left corner, and then you’ll see a prompt where you must enter your password. The Software Update system preference is the same in Lion and Snow Leopard, except the Lion version (above) has a lock to prevent changes. To have Software Update run automatically, click the Check for Updates checkbox. In the pop-up menu, select Daily, Weekly, or Monthly. Remember, you can always run Software Update manually when you feel like it, either through ? 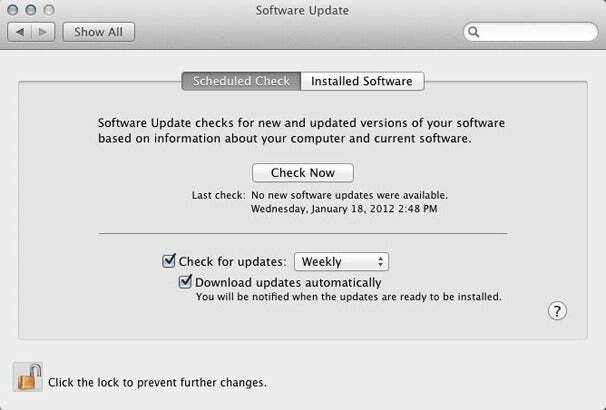 -> Software Update, or by clicking the Check Now button in the Software Update system preference. If you don’t want Software Update to run automatically, uncheck this box. Software Update will alert you when updates are available. When selecting the Check for Updates box, a setting below it will become available. This setting allows your Mac to download the updates automatically, if any updates are available. If you decide not to activate this feature but still have automatic checks for updates active, then Software Update tells you that updates are available, and you’ll have the option to see a list of the updates, defer the updated until later, or to go ahead and install the updates. In the Software Update system preference, there is a second section called Installed Software. This provides a list of the software that has been updated via Software Update for your reference. There are no settings in this section for you to change. When you’re done, lock the padlock on the lower left by clicking on it, and close the preference pane. If you bought a third-party application in the Mac App Store, use the Mac App Store to get updates. Other apps allow you to check for updates through the software itself, either through the app’s preferences, or through a menu selection.